My, how time flies! I’ve now been writing the Blonde Coyote blog for almost two years and after more than 360 posts, I’m in no danger of running out of places to go or things to say. This blog has proved the perfect venue for combining my loves for writing, photography and travel and I have no plans to slow down any time soon! I’m always scheming and lately, I’ve been thinking about how this blog should evolve in the coming year and I’ve decided it needs to wander more, through both chronological time and geographical space. Thoreau’s Cabin Site! 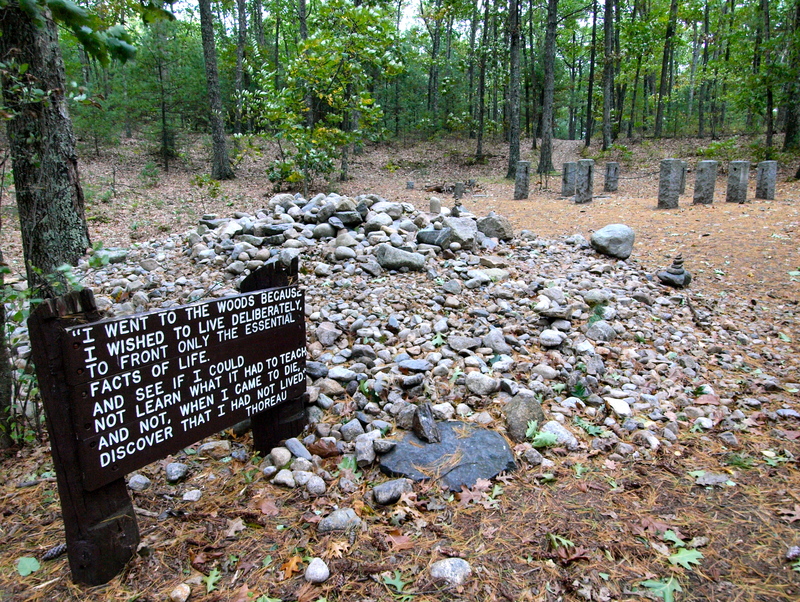 I visited Walden Pond in 2010 and still haven’t gotten around to writing about it on the Blonde Coyote! Over the past year, my posts have been pretty linear: from buying my Teardrop trailer last March to test driving it through Utah, and along the spine of the Rockies to Wyoming, then West across Nevada to California, up the coast, then up the Cascades to British Columbia, from there to Alaska, back south through the Canadian Rockies, across the Great Plains to spend leaf season on the Appalachian Trail in Virginia, then up to Vermont via Niagara Falls, my 5th Great Lake and the Adirondacks, all the way South through the Florida Everglades to Key West and then across the country again, back to New Mexico. It’s been quite the year! 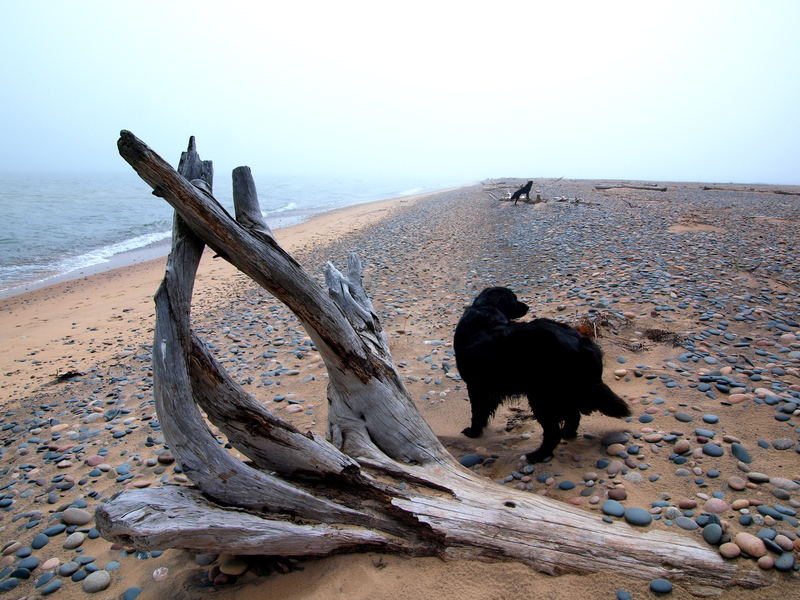 The Shipwreck Coast of Lake Superior in 2010. Now, hang on tight, because we’re veering off course! I’ve been writing this blog for almost two years, but I’ve been living on the road for about seven years and I have a huge reservoir of photos and stories from places that have yet to make an appearance on the Blonde Coyote, either because I visited before June 2011 or I didn’t have the time, energy or inclination to write about them along the way: the world’s only public diamond mine in Murfreesboro, Arkansas, the Center of the Universe aka NYC, winter on the coast of Maine, the Devil’s Tower in Wyoming, I could go on and on! 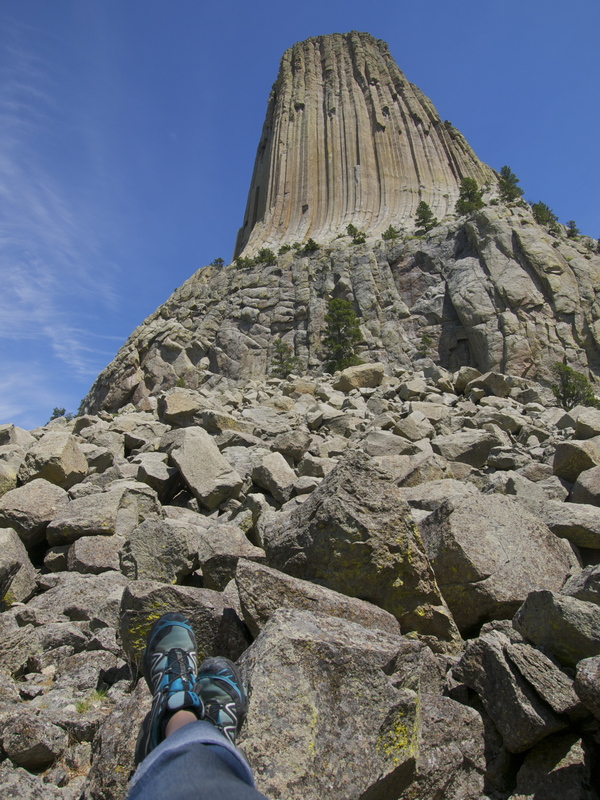 Self Portrait at the Devil’s Tower last summer. I’ll still have some timely updates along the way: right now I’m in New Mexico and earlier this week, I went goat herding on horseback so stay tuned for a post on the Horned Locusts! I’ll be in the Land of Enchantment for a couple of weeks, then I’m going to the Grand Canyon, then spring in Utah, then summer in the Rockies and then fall in Ireland and Scotland! It’s gonna be another great year! Welcome back to the Wild West! Thanks to everybody who follows the Blonde Coyote! My mission in life is to see and experience as much of this Earth as possible and I’m thrilled to have so many enthusiastic and encouraging readers along for the ride. I hope I’ve inspired all of you to get out and explore your own corners of this awesome planet. If you have any regional or location requests, please let me know! I’ve been hiking and road tripping in all 50 states and if you’re looking for some place interesting, I probably have some ideas! 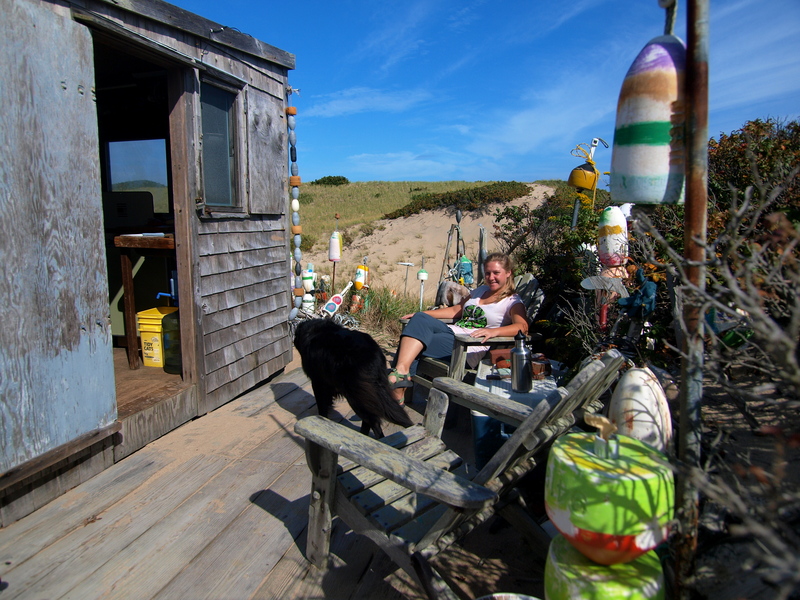 Chilling at my Cape Cod Dune Shack, also on my to-write list! Want to support the Blonde Coyote? Buy a print! All of my photos are fair game and very reasonably priced. Contact me at theblondecoyote@gmail.com. If you ever want to explore the Superstitions and have a home base, we would love to meet you. You can read about my family at azsoap.wordpress.com, we are in Gilbert AZ. My favorite way to fall in love with the Superstitions is to read about it here: Browse his photos, he is amazing. https://www.facebook.com/Tom.Kollenborn (a different kind of voice, he found all of his adventure in one place). I’m not sure how I stumbled across your blog, but I love it! It’s like a real-life road map for what I hope to be doing in this next phase of my life. And your photography is wonderful. So thank you for sharing. 🙂 I’m planning on roadtripping around the West this summer and then spending fall in Scotland and Ireland too actually, so maybe we will cross paths! Also if you’re back in Vermont before then, you’ve got a place to stay. “…I could go on and on!” And we hope you do! Wow! I’d love to hike at Havasu. Some of the teachers at Waldorf where I teach take their 8th graders there. I thought there was more involved to go to Havasu and I don’t know how to go about getting permits there. Not sure I have hiked enough this winter and spring to be ready for it now. The permits we put in for included some routes not on the main corridors, but we were still denied – ie the campsites we requested were full. Spring break is not the best time to try to get permits, but that is when I am free. I think we will go again in November, like we did before. Not sure about the real primitive hikes – think we need a bit more experience in the Canyon first. I will keep on eye on my email. It would be super to meet you before you head to the Grand Canyon and Utah. I’ve only been to Arches once, so I am excited about going there again. Here’s the link to info on Havasu fees and permits. I have no idea why it’s on a wedding guide site, but it’s the best resource I’ve found. I called the camping reservation line yesterday and had no trouble getting permits for early April. If not for this trip, for future reference: http://www.myarizonaguideweddings.com/html/havasuapi_fees___permits.html. Arches/ Moab is amazing! Check out Dead Horse Point, Fisher Towers, Castledon Tower, and the Sego Pictographs outside the park. The Devil’s Garden is my favorite Arches hike. Have fun! I’ll be there later in April. Thanks for the links to Havasu. I’ll look into them. May not happen next week, but as soon as we are able. Also, thanks for the tips on what to look for at Arches. I will definitely make notes of those spots. When we were there before, it was December and the days were short, so we didn’t see as much as we wanted. It was still amazing, however. Thanks for sharing your journey…I look forward to your future posts and am always so excited when I get the message you have left one out there for us to read! I came to Colorado when I was your age and never left, and now 27 years later I plan to go on the road to live, so you inspire me! I do follow and Love you blog. Question? How do you finance your travels? Inheritance?, sales off photos? or jobs here and there? Just curious. I did selling at flea markets, fairs when I travelled 2 years in RV. back in 90’s. I am planning to get an RV again soon and to travel indefinitely. I will however need to make some money on the road. Not a lot but some . Hey Sue! Thanks for reading and for asking how I pull this off! I don’t just write for fun — this is how I make my living. I’m a freelance writer. Since I can work from anywhere, instead of paying rent, I live on the road. I write mainly for EARTH magazine, between 7 and 10 stories a month, including the Travels in Geology column, with a few other jobs here and there. Here are links to two of my recent features: Setting Sail on Unknown Seas and Travels in Geology: Hike to the Burgess Shale. My background is in geology and biology (I was a self-designed evolution major in college) and I have a master’s degree in science writing from Johns Hopkins. One of these days, I’ll get myself a book deal! I would buy your book in a minute. 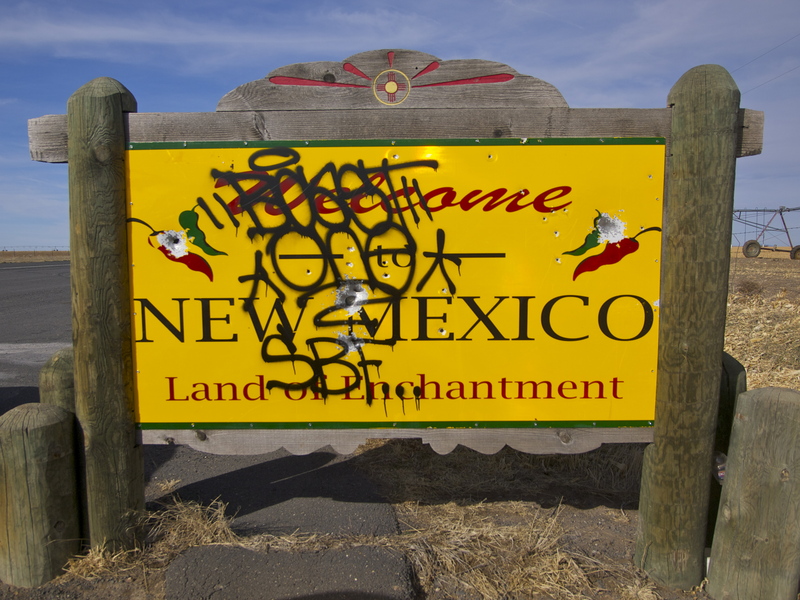 I’m going solo in June, to New Mexico. First time solo! Yea! Looking forward to seeing your future posts. I’m from the uk and I love to follow your adventures, they are a world away from my own but always inspire me! Thanks, Chris! I’m coming to your side of the pond next fall! Flying into Dublin and then ferrying across to Scotland. Any suggestions? I’m hoping to travel on foot as much as possible while I’m there. I don’t know where to begin, there’s so many great possibilities. It all depends on how much time you have and wether you wish to travel just under your own steam or are willing to hop on a train to get around. Perhaps we could meet up for a hike and I could introduce you to Eliza my little hound? Bex and I are always willing to offer warm meals and a bed to folks passing through. Oh man! You’re photos make me just want to get on the open road + drive!!!!! What an amazing life and an incredible blog! How inspiring! I need to get back on the road.